The Geobrugg marshal post is designed to protect both marshals and track workers. Its unique design offers a high level of protection and the flexibility of moving the marshal post around your circuit. The marshal post consists of a solid NORDBETON concrete base with our marshal post fence panels. The trackside facing panel has two openings allowing flag operations or a fast response in case of an accident. As a stand-alone solution, the marshal post can be installed free-standing or behind a guardrail. For free-standing solutions make sure the marshal post is additionally protected with tire six packs. According to the customer's requirements, we can also plan for and include implement openings, i.e., for camera teams or photographers. 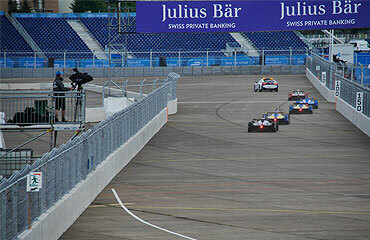 Our barriers are installed at FIA and FIM homologated circuits around the world. Our design enables to easy relocate the marshal post in case of circuit modifications.